Photographer Marilyn Ortega's contribution to the "World Without Prisons" art project, hosted jointly by Project NIA and HumanThread, two social justice groups. BRIDGEPORT — A collaboration between jailed teenagers and artists aims to shed some light on the social problems associated with widespread incarceration. "Prison basically makes people worse. They are super expensive and they haven't made us any safer," said Mariame Kaba, director of Project NIA, a North Side advocacy group focused on replacing the incarceration of youths with more productive alternatives. "We want to raise people's consciousness on the issue and their mindsets on punishment." For that, the group is hosting an exhibit called "A World Without Prisons," which they're billing as an "inside-outside" exhibit — meaning there will be photos from activists, educators and artists on the outside of jail walls, as well as from the teens locked up inside them. Earlier this year, the Rogers Park-based organization partnered with the Free Write Jail Arts and Literacy Program, in which volunteer artists and educators teach courses to teens incarcerated at the Cook County Temporary Juvenile Detention Center. A handful of jailed teens have contributed artwork and recorded poetry to the exhibit, which was scheduled to debut Monday at the HumanThread gallery on the fifth floor of the Bridgeport Arts Center, 1200 W. 35th St.
Tim Wais, a board member of HumanThread, said the collaboration was a natural fit for the group, which promotes nonviolence through a series of ongoing programs, ranging from open mic sessions for high school kids to provocative art exhibits. Also on display with the exhibit will be a series of photographs from educators, activists and advocates all depicting the theme of a world without prisons. Some have taken the concept quite literally, with one contributor removing the Cook County Jail from the landscape entirely, leaving behind a grassy and serene space. Another contribution shows snapshots of the "Milk Not Jails" effort, a New York nonprofit that aims to employ ex-offenders. 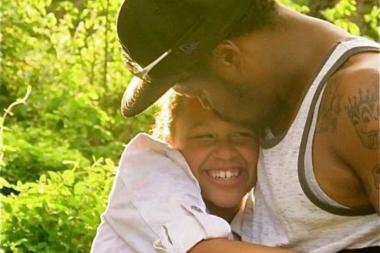 Another photo shows a young girl and her father smiling as they cuddle in golden sunlight. Some of the photos can be viewed online here. "We're trying to raise awareness on prisons and the prison industrial complex and its impact on our communities. For us, that's an ongoing thing. We use art and any other resources and tools to spark larger conversations in the city and beyond," Kaba said. An opening reception is planned for 6 p.m. Friday and will include performances from Circles & Ciphers, a leadership program that blends improv hip-hop and peacemaking, and from the Elephant Rebellion, an art collective. The exhibit will be on display through Dec. 6.